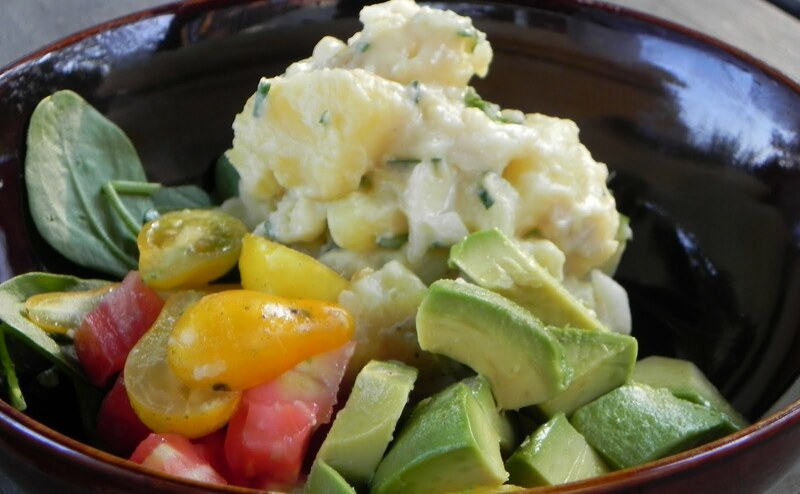 Potato Salad and Summer just seem to go hand in hand. Growing up in a Pennsylvania Dutch Family potato salad tended to be sweeter than most. Passed down to me was a recipe that used a cooked dressing with eggs, cider vinegar and sugar. It was loaded with celery, chopped eggs, diced potatoes and grated carrots. When I was introduced to Werner’s family in Schlatt, Switzerland they made a whole different kind of potato salad. I have some very fond memories of evenings at the farm grilling the best sausages you can ever imagine and pairing it with this wonderful take on potato salad. This is as close to that recipe as I can come as I don’t think they used one. The key to its wonderful flavor is the beef bullion. If you want to keep it vegetarian use vegetable stock. In the photo I served it with diced avacado and a mix of yellow and red heirloom tomatoes. Add a grilled sausage and this would make the perfect summer supper.